I've certainly enjoyed Project Advent so far. If you have enjoyed reading about it, I'd like to invite you to help me out with an upcoming project. Although there are several charitable endeavors that they are involved in, the Houses are probably what they are best known for. Ronald McDonald Houses offer an affordable place to stay for families who have to travel to be with hospitalized children. Maybe they will be there for a night, and maybe they'll be there for months, but the RMHC gives them comfortable surroundings in a very tough time. Although I have never personally known anybody who had to use RMHC's services, it is still an organization that is special to me. In 1990, when I was finishing the requirements to earn my Eagle Scout rank, I worked with the administrators of Lubbock's House to plan and perform a service project for them. My team did three days of landscaping, repairs, and cleaning, and finished it by preparing dinner for the guests. On Monday, December 19th, I'll be returning to the House and making dinner for the guests once more. I need to prepare enough food for 40-50 people, and they have requested that it not be pasta or lasagna, as they have lots of people prepare those foods. The kitchen is a good one, with four ovens, two ranges, and any other necessary appliances, so I have a good facility to work in. I'm planning a menu of delicious foods that I can prepare myself, so that I can make my budget go as far as possible. What I need help with is raising money to cover the cost of food. If you can contribute anything at all, I will be very appreciative. Every cent that you send me will go towards this project. 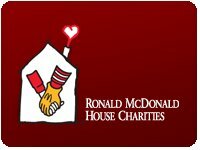 If I receive more money than I need for the dinner, then I will write a check to RMHC for the extra amount. I'll even write a blog post to provide an accounting of the money sent to me and how it is spent, so that you'll trust me to be accountable with it. To donate, just click on the Donate button below to make a contribution through PayPal. I believe it will show up on your credit card statement as "LWDM-ProjectAdvent." I will also have this button available on the right edge of the blog until the 19th, so that it's easy to find. THE FUNDRAISER IS NOW COMPLETE, AND THE BUTTON HAS BEEN REMOVED. THANK YOU FOR HELPING ME! Thank you, friends, for helping me make this happen. God bless you! "We cannot process this transaction because there is a problem with the PayPal email address supplied by the seller. Please contact the seller to resolve the problem. If this payment is for an eBay listing, you can contact the seller via the "Ask Seller a Question" link on the listing page. When you have the correct email address, payment can be made at www.paypal.com"
Thanks for letting me know, Steve. I think I have the error worked out now - I'm sorry for the trouble! No problem. Donation coming your way shortly. Still getting the same error. I'll try again later, maybe it takes some time for changes to go through? If it doesn't work with the button, I'll try to just Paypal you some money directly. I just donated directly via Paypal (rather than through the "Donate" button) and it seems to have worked. Awesome that you're doing this!